About: Posts 1-320 were done by the original player. 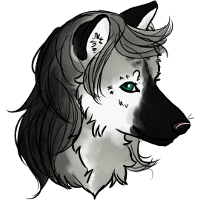 Appearance: Fayne is a dainty thin figured wolf with long legs and she stands about 2'2" at her shoulder blades. Her coat is full and luxurious giving her a noble appearance with a beautiful silver grey hue to it. So well taken care of it's has a shiny tint to it. Her face has black and white distinguishing marks around her eyes and black on her muzzle. The white starts above her eyes and continues along her cheeks fading grey. A black stripe starts on her forehead and follows the length of her back all the way down to her tail fading into grey, then to white from her ribs down to her stomach. Her paws are mostly white with dribbles of black. Fayne's eyes are an emerald green with a blue hue to them. She's quite a stunning creature. In her Optime form she stands about 5'8 and her figure is lean. Her chest is large and covered in a plume of fur. She has a black mane that can be perceived as long black hair that drapes on her shoulders and fades into the black stripe on her back. Her hair is messy and uneven; it's never been trimmed or cut in any way. She looks like a Luperci with a bad hair day. Her bangs are silver and white like the rest of her and fall into her eyes. Her hands and feet are light in color and fade into a darker shade up to her shoulders, which are black. Fayne usually stays in her Lupus form. She hasn't yet fully explored the extent of her shape-shifting due to her age and strong urge to cling onto her past as a pure wolf. Though she can't resist those terribly strong urges she gets from being a new Luperci Verto, she tries to limit the time spent in those forms and usually keeps herself secluded during shifts. She has two scars, one small chip in her right ear and a large scar on her left shoulder in the shape of a wolf's eye. It's incredibly detailed and well drawn for being drawn in flesh. Next to the eye, is a small slash mark inflicted on her by Kohaku as one of Amy's lessons. She wears a deep green stone pendant that Noah gave to her as a symbol of their mateship. She never takes it off. Personality: Fayne is a light spirited and talkative young wolf. She has strong opinions about everything, though she knows how to hold her tongue in most situations. She can get a bit mouthy if she's being talked down to. She holds herself highly, and proudly, but there is always a lingering self-consciousness within her that only those who know her well see. Over the years she's grown a feeling of uselessness but that never dampens her determination to better herself. She can be rather quick to trust and is generally a good judge of character. She has a small voice, but usually very kind to those who treat her with equal kindness. Her hunting experience is horrific, which makes it easier for her to accept her roll as healer and gardener. Her inexperience with things where most of her doubt comes from and she has a lot to learn. She's has the weight of the world on her shoulders, as she feels that others' problems are her own and she tries hard to help wherever needed. Her pride is her vice. She has trouble knowing when she should back down or accept help. She can be rather reckless both with her actions and her words and this lands her into trouble every now and then. If you get to know her, you'll see that she's a fireball of ambition with a will of iron.